Is there a better alternative to Email Backup? Is Email Backup really the best app in Backup category? Will Email Backup work good on macOS 10.13.4? Email Backup is an easy to use, automated email backup solution. It allows for scheduled backups of the most common email applications through the configuration of a simple interface. 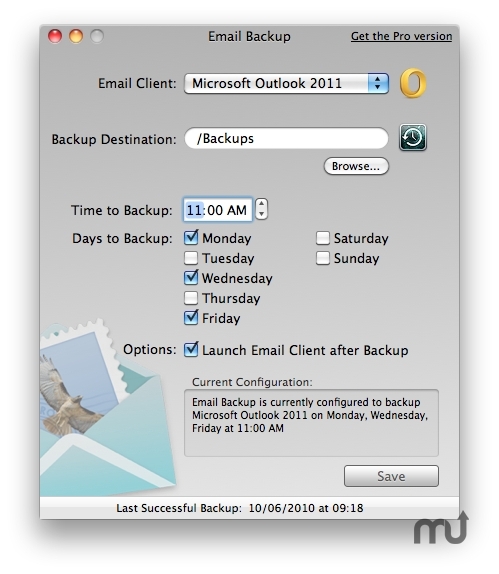 Added support for Outlook 2011. Fixed issue with strange characters in destination path addresses. Fixed issue with space in username. Fixed bug in auto updater. Updated Email Client Quit code. Email Backup needs a rating. Be the first to rate this app and get the discussion started!